The Itty Bitty Kitty Committee: It's Geraldine!! Remember this cute little girl? Of course you do. Out of all the IBKs, it seems that Geraldine might be one of your favorites, so I know many of you will be excited to see this gal again. I've had MANY requests for updates on her. Actually, not just her, but all the Dearborns. Amy, mama to both Geraldine and Phoebe, sent me a batch of pictures of both girls. I thought we would start off today with Geraldine, and tomorrow we'll have Phoebe, AND an adorable photo of the girls together. 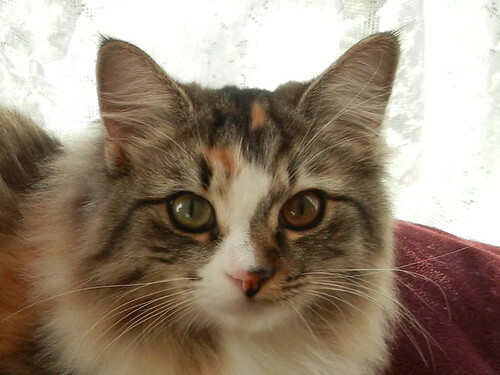 Geraldine is very curious and playful. She loves to sneak down to the basement and go spider hunting. She has the tiniest of meows but purrs easily and she is ultra relaxed when you pick her up. Geraldine has two different color eyes! The right one is green and the left one is brown. She also has an orange patch on her shoulder that looks like a heart! What a gorgeous girl!! Just LOOK at that TAIL!!! I've been communicating with all the Dearborn adopters, and hopefully this week we'll have updates on the entire litter!! Tune in tomorrow for Ms Phoebe! Thanks so much for the update, Amy! Wow. That tail is substantial. Well, now, as a noodge for pictures and an update on Geraldine, I must say that it was worth the wait. The girl is gorgeous!!! I love her coloration, her eyes, her lovely furs and her magnificent tail. Aunt Geri will be proud of how her namesake is growing up! Geraldine has grown into such a gorgeous young lady! (And she was obviously paying attention during Charlene's floofyness lessons!) How unusual is it for a cat to have heterochromia? Great update....she is lovely. And that tail is AWESOME!!! I was just going to bug ya to update my fave - PEARLA!!!! And, wow, look at that floof!!!! She is so much more gorgeous than I ever expected!!! Geraldine has her own pet fish! Lucky girl! She is sooooo pretty. That tail needs its own ZIP code! What a gorgeous cat and magnificent tail! What a breathlessly beautiful cat she's grown into!!! I love all the IBKC kitties, but Selma stole my heart and still hasn't given it back. Any updates on her? Man!!!!! Did she grow up to be a stunner, or WHAT!!!!! But I do think that tail had to have been photoshopped from a world class raccoon. Gorgeous from every angle. She is STUNNING and that tail is definitely of Beannie proportions. She looks happy and content - obviously well loved. Thanks for the update - looking forward to seeing Ms Phoebe (squee I loved her). I love the way the markings on her face changed shape and almost make a white diamond. If she works hard, she can have the whole suit, LOL. Wow, she almost rivals the Bean in kitty gorgeousness. Almost. 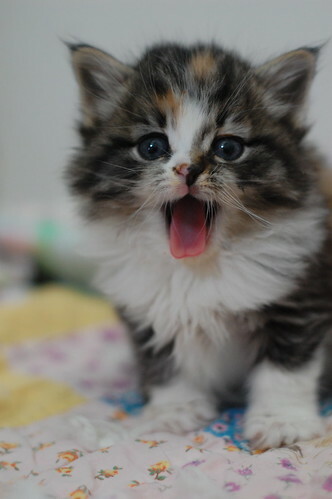 I always loved that picture of her as a kitten with her little pink mouth open. I must get the magnet with that photo. Oh my goodness what a gorgeous cat she turned out to be. Look at that tail. Thanks for the update! Wow, has little Geraldine ever turned into a major stunning beauty! And such serious floofiness -- I can feel right through my computer screen how soft she must be! I'm just repeating what everyone has already said, but THE TAIL!!!! I've never seen any to equal these epic proportions! and she doesn't even look full-grown! What a beauty. I was just yesterday looking at the Dearborn kittens and loving Geraldine. She looks very happy in her forever home. Can't wait to see the next installments!!! EEEEP!!!!! I cannot handle the tail! Also, that must be a very trusting family to leave the goldfish bowl open like that... Great pictures. Oh, wow, who grew up all purty then? with a superb tail, too! Hows about a kiss? I love the white ruff around the neck and what an amazing fox like tail! Wow! Wow. What a stunning beauty she grew up into. I'm just amazed that magnificent tail. And yay for more updates! I miss Pearla and Sheldon too. That is one gorgeous grown up Geraldine! Wowwee! What a tail!! She sure grew up pretty! Wow, such beautiful floof, especially the tail! Geraldine Dearborn and Edith Furman are my all-time favourite IBKs. I love floofy calicos. I have seen cats with one blue and one green eye but never with one brown. I have seen that in dogs but not cats. What a beauty she is. Glad she is so loved!!! Wow, she is gorgeous! That tail... holy cow. OMG, she is so beautiful! I honestly would not have recognized her from her baby pictures. 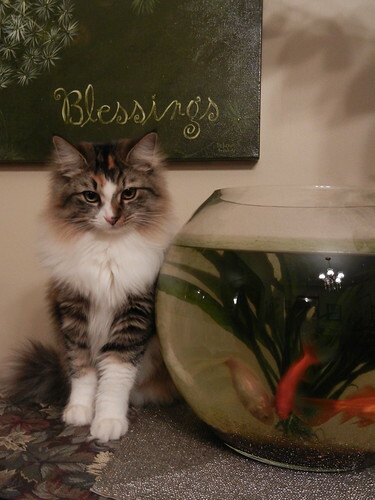 And she has her own fishies, too! I can't wait to see Phoebe and the rest of the Dearborns. They were one of the most special little families EVER! oh gosh, the eyes! she was a gorgeous kitten and now she is a STUNNING cat. oh my - she is a stunner! LOVE IT!!!!!!!! Thanks to Amy for sharing. How could I ever forget dear Geraldine. She's one of my favourites from one of my favourite litters. And she's grown up into such a beauty--those eyes and that tail! I love the way her tortie colouring affects her eyes--how unusual and exquisite. I'm so pleased to catch up with her and her Dearborn siblings. that is one gorgeous cat!!! That is quite the tail! You could keep entire families warm with that tail. ;) what a sweetie! What a beauty, it must do your heart good to see the care and the love you put into all these kittens come to fruition. Good gracious that's a beautiful cat! I'm jealous, Amy! I knew she would grow up to be a flooflacious gorgeous girl but MY GOODNESS, never could I have imagined the extent of her beauty. She is STUNNING, absolutely STUNNNING. 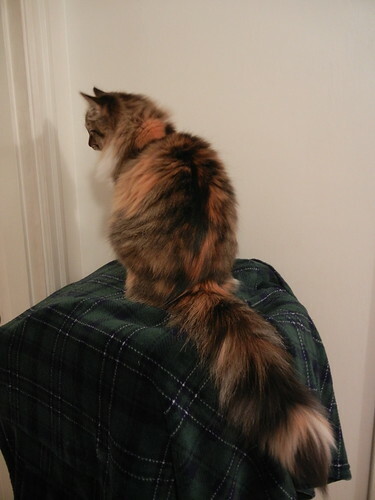 The brown and green eyes, the calico coat, the soft bunny fluff, the extraordinary tail... she is utterly magnificent! Geraldine, I have always had a crush on you but now I am obsessed! OMG LOOK at that monster tail! best tail ever should be a world record. Wow, Geraldine has turned out to be just as floofy as Charlene. I was curious so Tate and I measured the guard hairs on her tail they are more than five inches long! Also, her tail is more than a foot long. No wonder I am always waiting for it, when I shut a door!